Flat Iron Bike - Cycle tracks will abound in Utopia.Flat Iron Bike | Cycle tracks will abound in Utopia. A couple of weeks ago a large development dubbed Rêve (“dream” in French) became the first project to get called up by Boulder’s City Council at concept plan review (see the concept book for the project here). Rêve would occupy a 6.7 acre site on the southeast corner of Pearl Parkway and 30th St., just to the west of the Solana apartments. Much of it would extend south beyond the boundaries of the Boulder Junction area. I offered some comments to City Council on the project, as someone who would like to see more human scale, rather than auto-oriented development in Boulder. If we’re going to be able to do that anywhere, it seems like it ought to be Boulder Junction (formerly the Transit Village). Once we get the BRT up and running, it should be highly transit accessible. It’s surrounded by regional employment centers — the expanding east CU campus to the south, the new Googleplex to the east, and who knows what else eventually as the area builds out… or rather, builds in. Also, despite being part of “east” Boulder, Boulder Junction is really quite centrally located within the city as a whole. As I wrote recently both here and in the Daily Camera, I think that if it’s done with a particular focus on the human scale, and with less accommodation than we’re used to for automobiles, development in the area need not have substantial direct impacts on existing residential neighborhoods in the city, in terms of parking spillover, traffic congestion, and viewsheds. I’m not opposed to the overall intensity of the development. In fact, I think it could be much better for people on the ground with a higher FAR. Improving the project at the current or higher intensity hinges on doing a better job of curating and cultivating the spaces between the buildings, turning them into great outdoor rooms and corridors, and wholeheartedly turning them over to human beings. This is just a matter of focusing on traditional (like, thousands of years old) urban design. The design is based on long-standing Dutch standards, and actually embodies the prioritization of modes that Boulder’s TMP lays out (but which our physical infrastructure often fails to implement). These are intersections that just about anyone can walk or ride or drive through safely and with minimal stress. They’re not standard in the US. Yet. Let’s change that! If you live in Boulder, you’ve almost certainly noticed the construction along US-36 — aka the Boulder-Denver Turnpike. The main thing that’s being built here is one new lane in each direction. However, it’s not your average road-widening project. Usually when additional capacity is added, it’s rapidly consumed by induced demand. Instead, the two new lanes are going to be special managed lanes. What does that mean? These new lanes are going to be optimized for mass transit, in this case buses. It won’t quite be Bus Rapid Transit (BRT), in which the lanes are used exclusively by buses, passengers pay on the platform, and board like you would on a subway or light-rail line. The US 36 system will be somewhere between that and the express service that we’ve got now. Even at peak hours, when buses are departing every 3-5 minutes, there will still be a significant amount of spare capacity in the managed lanes. This capacity will be made available to high occupancy vehicles, and those that are willing to pay a toll. There may also be a number of permits issued for electric vehicles, though how that would work remains to be determined. The toll value, the number of passengers required to be considered “high occupancy” and the number of EV permits that might be issued will all be managed to ensure that the buses go at least 50 miles per hour. The two general purpose travel lanes in each direction will remain free to everyone. 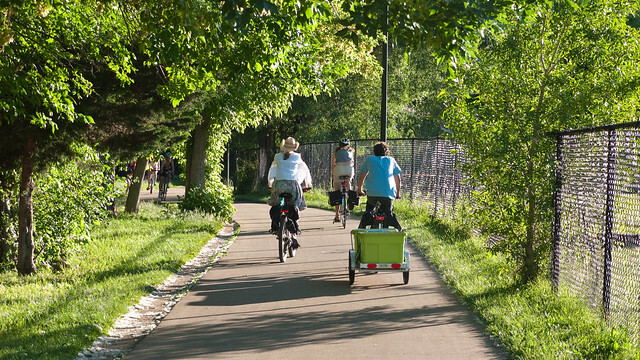 The last year has seen a flurry of Letters to the Editor in the Daily Camera from cyclists and pedestrians alike, frustrated at each others behavior on the Boulder Creek Path, and other well used parts of our path network. The debate has recently been re-ignited by the city’s proposal to allow electric bikes on the multi-use paths for the next year as a trial. Plenty of well meaning suggestions have been made to alleviate the conflicts — better signage, more enforcement of the existing 15 mph speed limit, education and outreach campaigns — along with the predictable complaints from each side about the bad behavior of the other: careless roadies zipping by at 20 miles an hours without any warning, careening around blind curves and underpasses on the wrong side of the path. Deaf iPod zombies walking dogs on 12 foot long leashes while they meander unpredictably. Etc.